One thing I’ve learned over time through building my wardrobe has been to not be too discriminatory in where I shop. Treasures can be found in the most unexpected of places, and this recent find confirmed that once again: I’d thought my days of shopping Forever 21 were long gone (I am a few years past 21 now, after all), but this coat pleasantly surprised me recently and has been one of my favourite pieces to cozy up in since. These are call it spring shoes? I gotta visit that store more often! Love this whole ensemble, so cozy and chic. The belt is amazing!! Beautiful coat, love how it looks with the belt. I love the way you’ve style the coat with the belt. It look lovely on you! I truly believe that the secret of great personal style is wearing what you love…you just radiate a genuine confidence and happiness. Do you ever check out Advanced Style?! Those ladies (and gentlemen, too!) sometimes dress in a way that might not be universally considered “age appropriate,” but they always look amazing!! Your black and white sweater is a find, I agree, and I am LOVING that belt!! Love this coat of yours! so gorgeous. The coat looks great on you. Love the whole outfit. The bag just adds so much to the outfit! Keep up the great work girl! The coat is truly beautiful, what a great find !!! You are so right about building a wardrobe and where to find pieces. Your outfit is fabulous! Really love the coat and the belt! I also love the red bag with your look. Love all around! 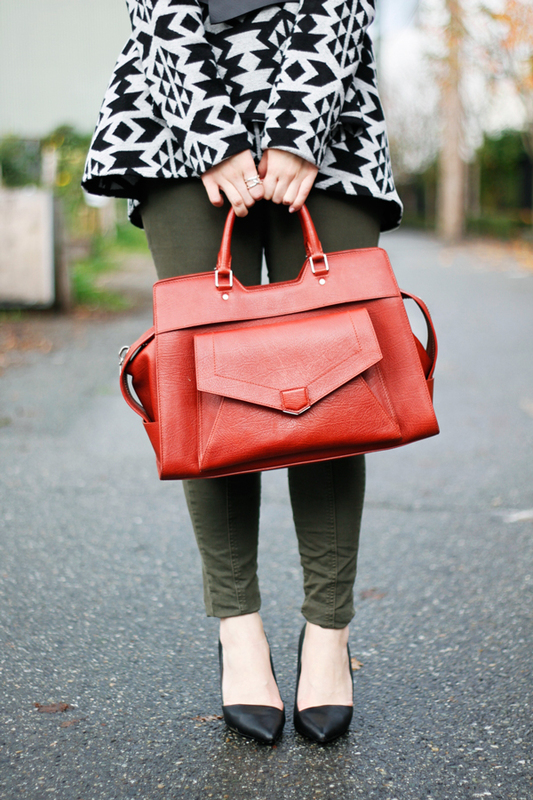 The autumnal colours in this outfit are gorgeous and sometimes Forever21 can really surprise you! 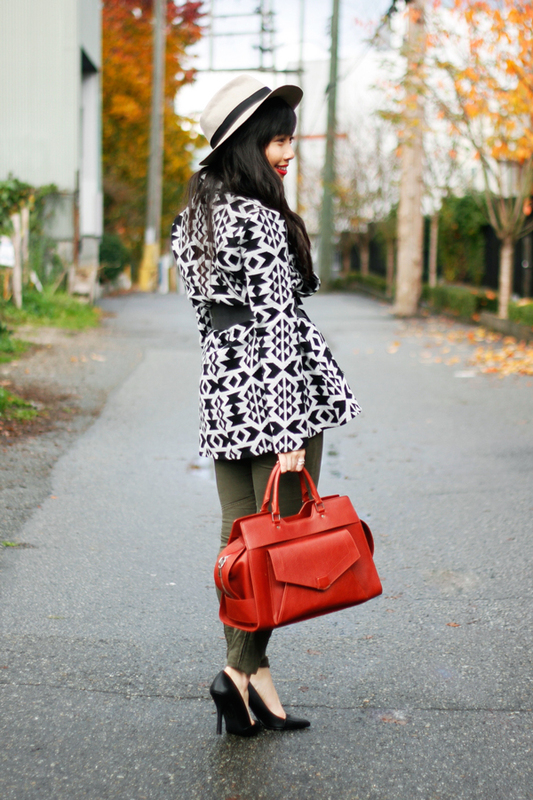 The way you styled the coat makes your find look much more high end than it is, plus the print is fantastic. 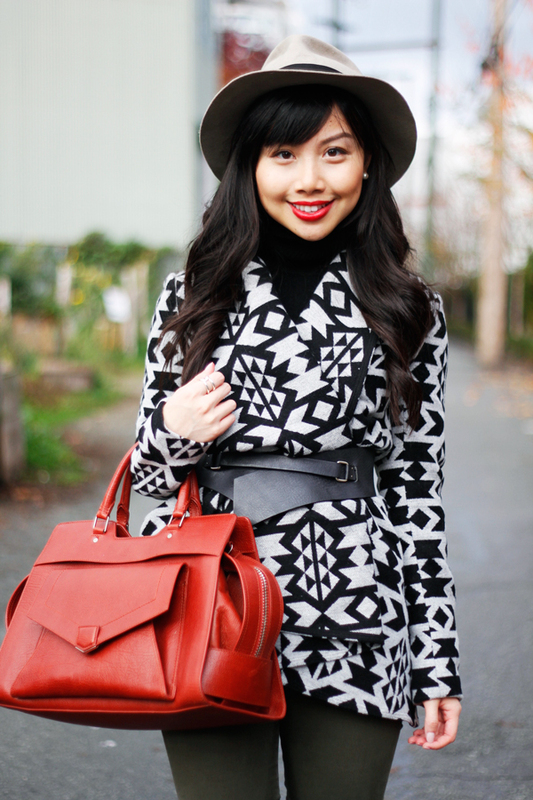 Pairing the wrap jacket with a thick belt like that was a great styling idea! This coat is beautiful. Forever21 can surprise you sometimes, great find!